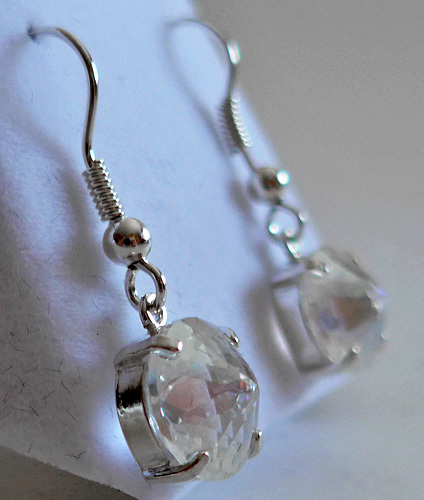 Dimensions (HxWxD): 1.125" x 0.375" x 0.35"
This lovely pair of Angel Aura Quartz Radiant Heart Hanging Earrings are irridescent and full of sparkling light! They come in a lovely sterling silver basket setting hanging from hooks for pierced ears and will light up your whole appearance! You will receive them in a lovely velveteen earring box for safe keeping. These earrings are much prettier than the photographs. Their irridescence is just stunning to behold! Quartz crystals have this marvelous ability because, metaphysically, quartz crystal expresses the unity of the five elements (Earth,Air, Fire, Water, and Ether or Spirit). Crystals grow deep in the earth and form much of the earth's crust, yet crystals, like the element air, allow light to pass through them. Crystals are fiery in that they have piezoelectric properties yet they are watery in their hexagonal molecular structure which resembles snowflakes, and in their ice-like appearance. Note: Weight above is shipping weight. 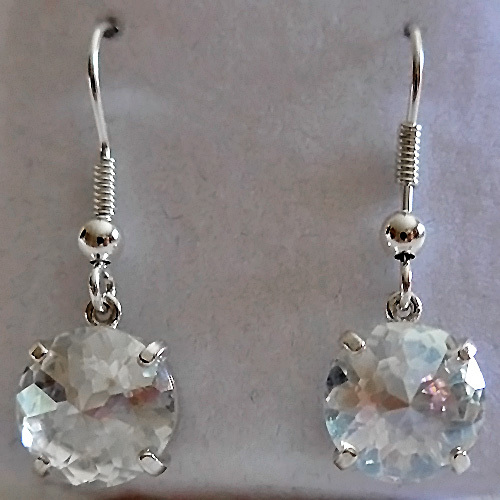 Actual weight of earrings is 3.3 grams for the pair.